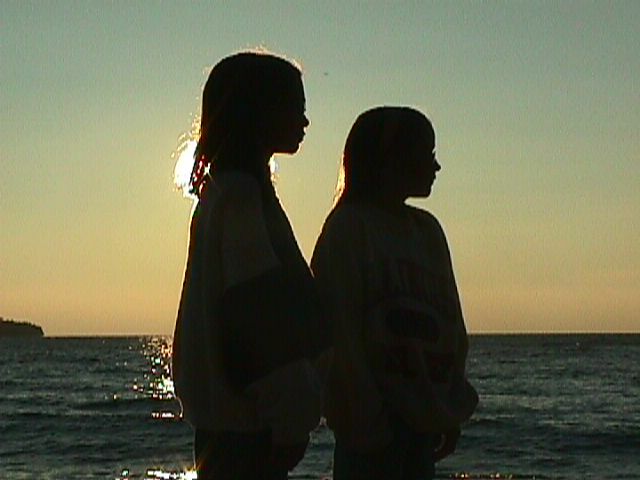 We picked up Anna's two friends, Emma and Kara Tauchman, and hit the road for Door County. We stopped on the way to see our friends, Peter and Laural Culp. 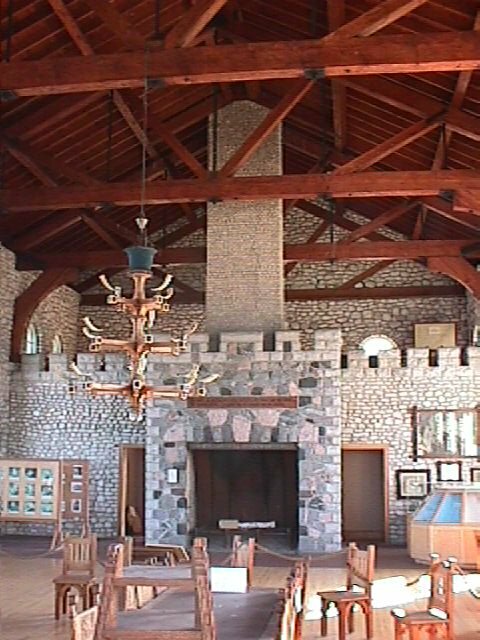 The Culps own the Nordic Lodge. 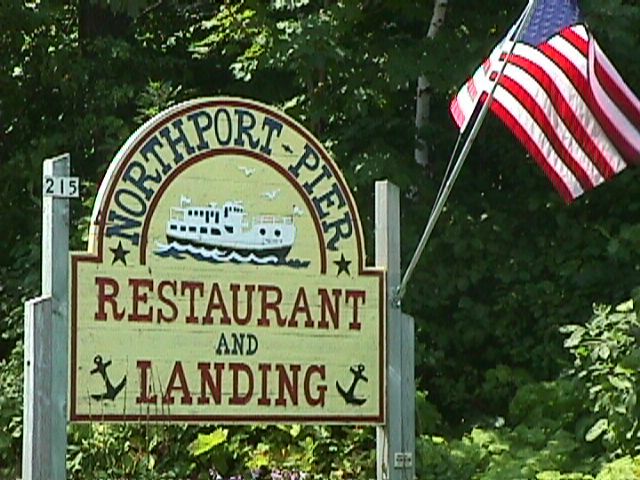 With only a few short stops we arrived at Northport just before noon. With the addition of Emma and Kara, we ended up with three girls and three boys. 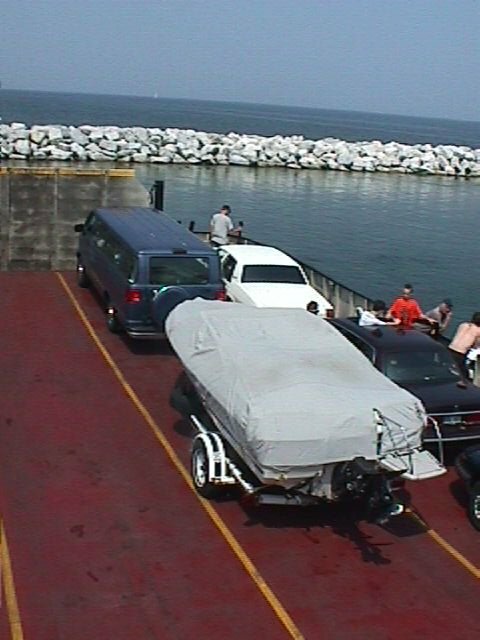 We were lucky to be able to get on the next ferry to Washington Island. Traveling on a Monday is much less hectic than a typical weekend day. 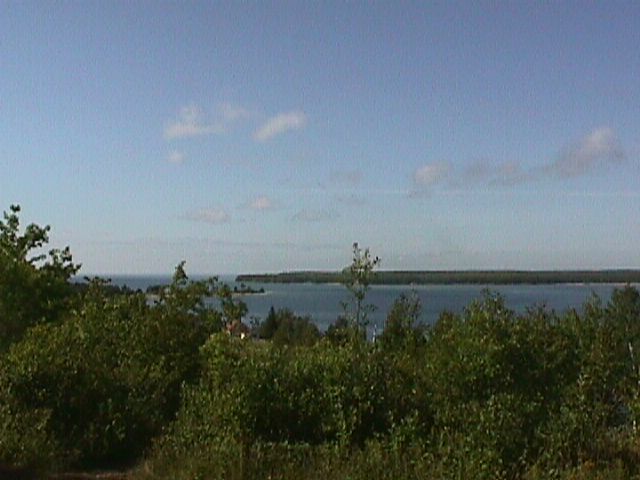 A short ferry ride and a quick trip across Washington Island brought us to Jackson Harbor. There is a shallow connection between the two islands, with one narrow channel. Here is a satellite photo of the cut. Within 15 minutes of putting our boat in the water, we had the first load over to Rock Island. We lucked out and had smooth water and a camp site (#28). Unfortunately, Kara leaned over to look at the bottom of the harbor and a lens dropped out of her glasses. She watched it sink out of sight with her good eye. More about that later. We were able to bring the boat within 50 feet of the campsite. This made for quick unloading. Here is a close-up satellite photo of the island. Within an hour we had everything and everybody safely deposited at our campsite. We were able to purchase some firewood ($5 for an armload). The water was warm and calm, which favored lots of swimming. 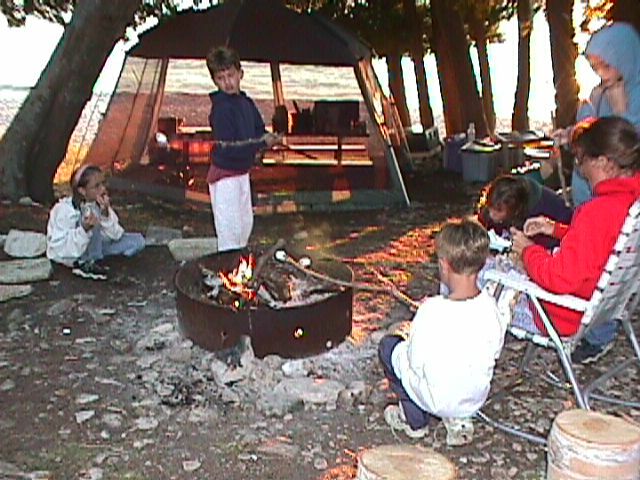 Even though the campsites were nearly all occupied the island was never really crowded. 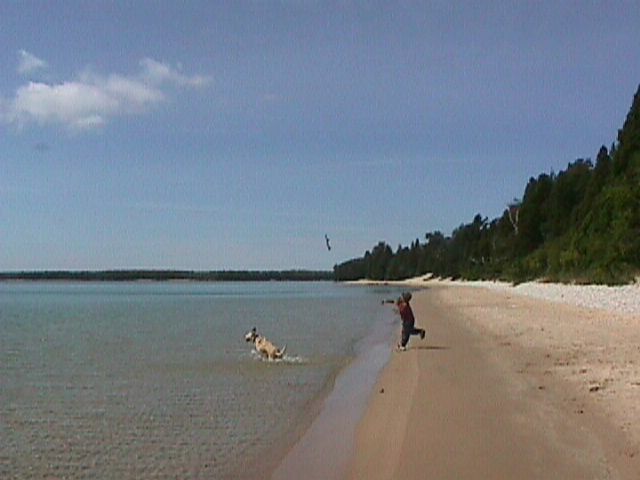 The beaches were extra large this year due to the lower water level. We had some gorgeous sunsets. The Tauchman twins were able to hold still for a silhouette shot. We had calm water for all 4 days. This made it possible for all kinds of water based activities. Kneeboarding, water-skiing, snorkeling, skibobbing and fishing took up lots of time. Here is a link to a satellite photo of the boathouse. Bill went skin diving for Kara's lens. After stuffing 5 large rocks in his bathing suit, he was able to achieve neutral buoyancy, and after an hour of searching, found the missing lens. He sure is stubborn! 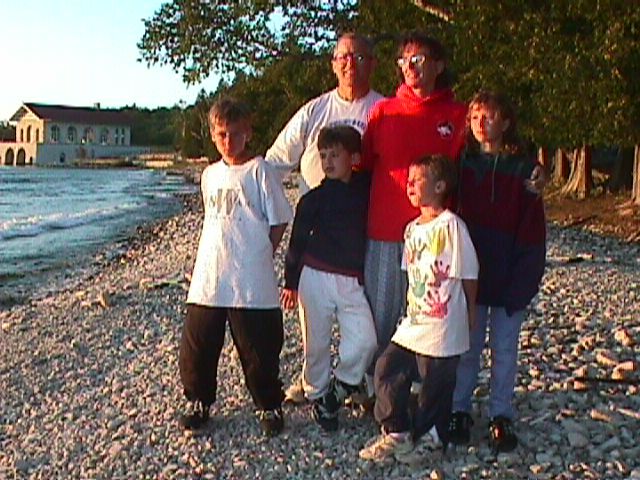 Every year, we take at least one family hike around the island. 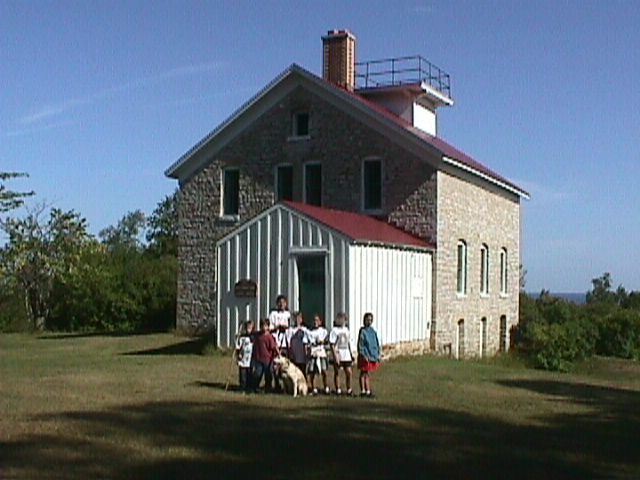 The hike includes stops at the famous lighthouse. Click here to see a web page of the restoration work. There are some people who call themselves "Friends of Rock Island" ( FORI ). They are proposing to create a bed and breakfast at the lighthouse. I don't view this as an act that a true friend of the "island" would even consider. I envision increased traffic, trucks, supplies, trash, and further development. This could be the camel's nose we don't want under our tent. We enjoyed lots of free time. Billy and Bill were the official firewood collectors. We left about $30 worth of firewood (Rock Island prices) at our campsite for the lucky people who were assigned our site next. The island is literally covered with dead and down wood. Our cart makes it easy to get plenty of firewood in a few minutes. Adam enjoyed helping the dog with her favorite activity. Zoe is a natural retriever and swimmer. She would spend all day in the water if we let her. 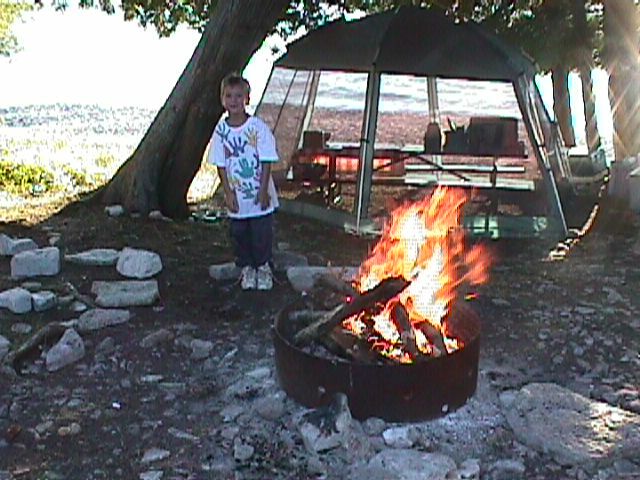 We had a nice campfire each evening. We even brought some marshmallows for making "s'mores". 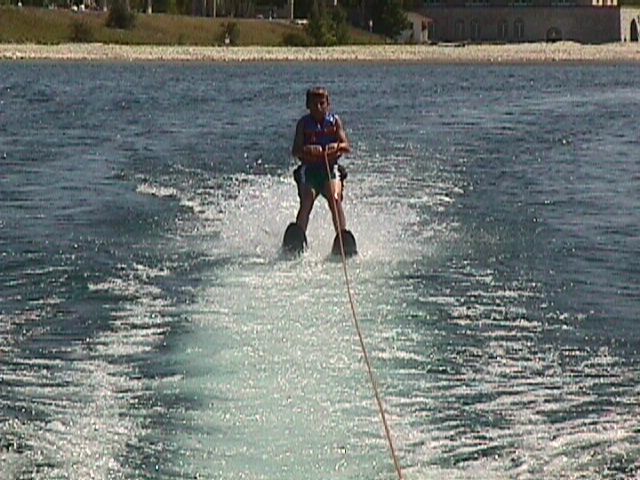 John surprised everyone when he got up on water-skis on his first attempt. John also ran a three mile distance workout with his dad. He was kind and ran slow enough so that dad didn't get too tired. Everyone had a chance to tour the boathouse. This facility is truly amazing. Imagine the parties that were held here during prohibition. 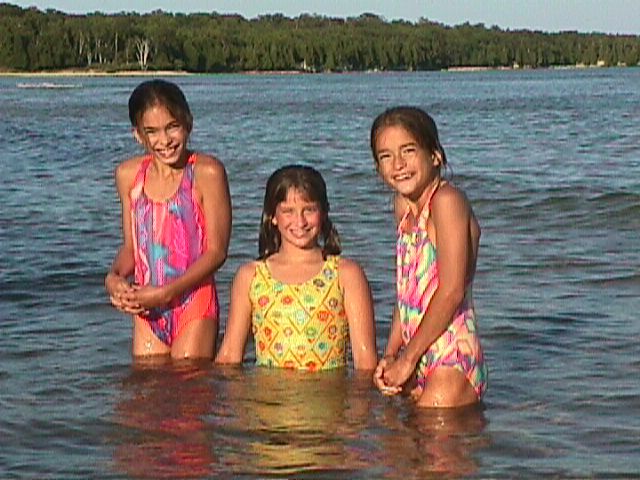 One evening the three girls decided they wanted to kneeboard from Rock Island to Washington Island. It took them less than 10 minutes to make the trip. The twins did some fancy moves during the crossing. 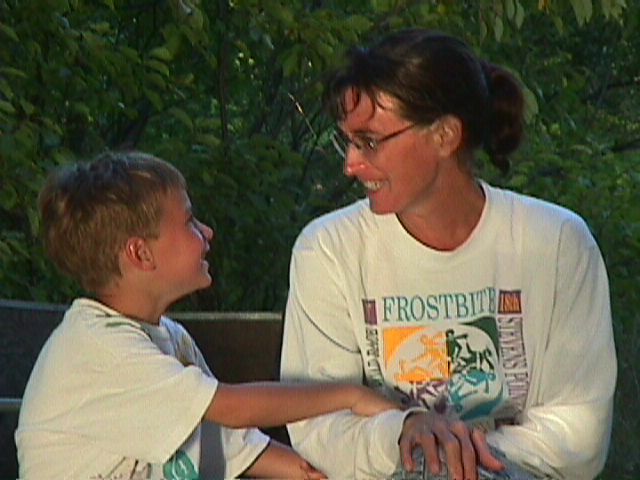 Billy and his mom had some good times. We read books, told stories and at night looked at the stars. Billy was a strong swimmer this summer. 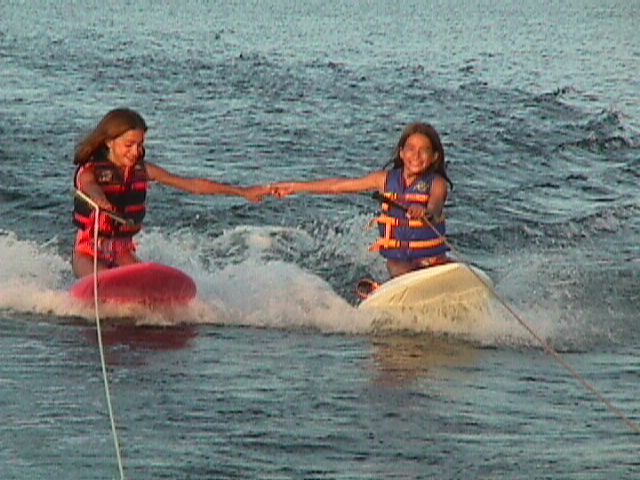 Her learned to kneeboard as quickly as anyone I've seen. 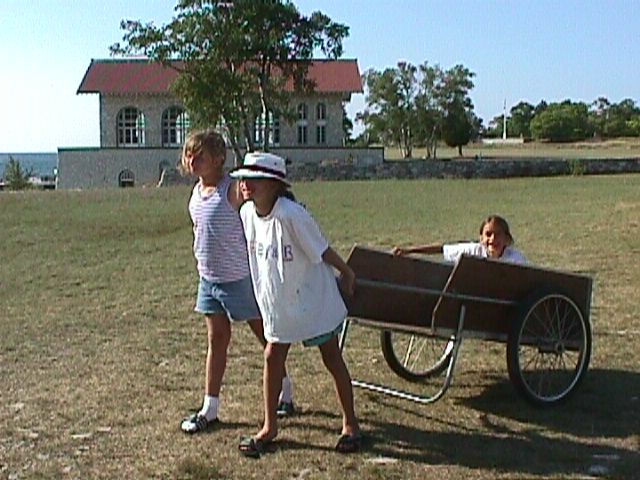 Our Gardenway cart was handy for hauling water and other cargo. 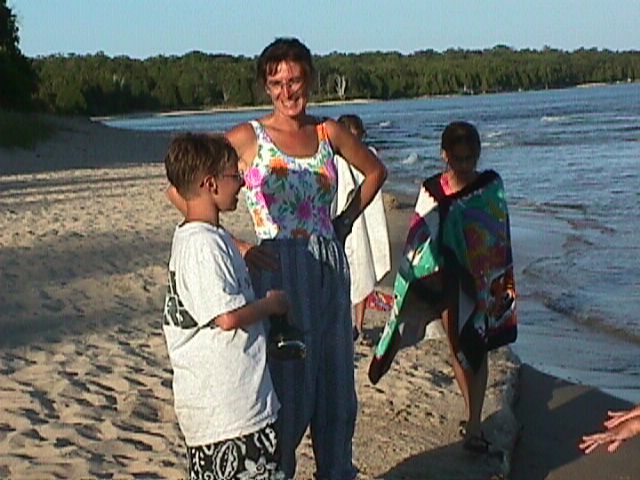 The beach was one of the daily activities. We were lucky that we had some waves on the last day of the trip. Sandcastles, king-of -the-rock games, and body surfing were fun for all. 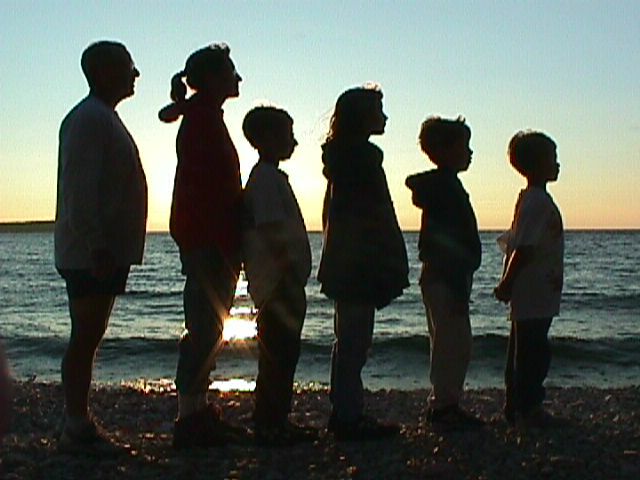 We tried one of our traditional family at sunset pictures. 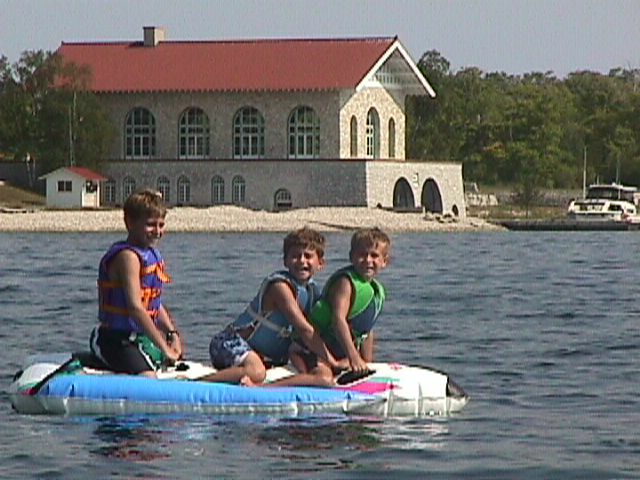 This was one of the best and shortest trips we have ever taken to Rock Island. The kids are already talking about going next year.